I’m reading this great book about tidying up your house. Her words seem a little hokey at first, and some of it feels impossible. But, we’ve managed to clear out a whole bunch of stuff already. In the book, she has a system for the purging. You start with clothes and books, then tackle miscellaneous items, and then move on to the more sentimental stuff. I’m having trouble getting started with the boys’ room. Because it walks the line between miscellaneous and sentimental. With each little t-shirt and toy I try to toss out, I get stuck in this sort of mom guilt nostalgic state. How can I throw away his very first toy that his Auntie brought to him in the hospital? How can I toss this shirt when he looked so gosh darn cute in it (when it still fit him)? I know that they are growing, and will keep growing, but I guess I feel like if I keep this stuff around I can somehow delay the process. There are toys that both of them are much too old to play with. Though, those toys do tend to emerge every once in a while as their Toy of Choice for a day. So, then I start to think, will they miss it if it’s gone? Then what do I do? Your baby rattle went to live on a nice big farm with all the other baby rattles that little boys got to big for. Or an item is tied to a specific event or a special day we had. How can I let go of the dragon stuffie we got on that trip to Portland when he was a baby? And they have zillions upon zillions of Matchbox cars. I mean, possibly a full ton. I don’t know how to purge that pile. Some of those cars hardly get touched, while some of them remain very popular, and I have to wrestle them apart because a fight will erupt over it. And I don’t know which cars fall into which category. There’s also a cache of toys I’ve handed down to them. A mish mash pile of old Fisher Price goodies and other such stuff that were still in perfectly good shape, so I handed them over. Those have double sentimental value. I remember fondly playing with those toys as a child, and watching them play with them. A new generation getting enjoyment out of them. Don’t even get me started on the books. I love buying books for them. I feel like they are a good investment. I want them to enjoy reading. When I’m at a garage sale or thrift store I generally clear the shelf. But, truthfully, they’ve both outgrown some of the titles, and I really should just donate them so someone else can enjoy them. But then all the memories come flooding back of cuddling up and reading those books to them. I have no qualms about tossing broken toys, or cheap Happy Meal goods, or the little nonsensical items that come in birthday party goodie bags. But, even those I wonder, do they still play with these? Will they miss them? 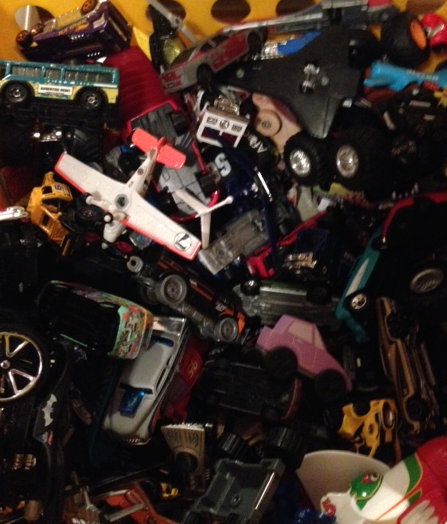 If you’re an overall tidy type of person, and often toss things out, please tell me how you handle your kids’ items. Is it harder for you? How do you decide what goes and what stays? Am I just being a sentimental weenie about the whole thing?